It’s Peach season! Yummy! I love peaches. :) Well sadly, my peaches were getting soft much faster than I could eat them, so I needed to figure out a way to preserve them as well as their yummy fresh taste. 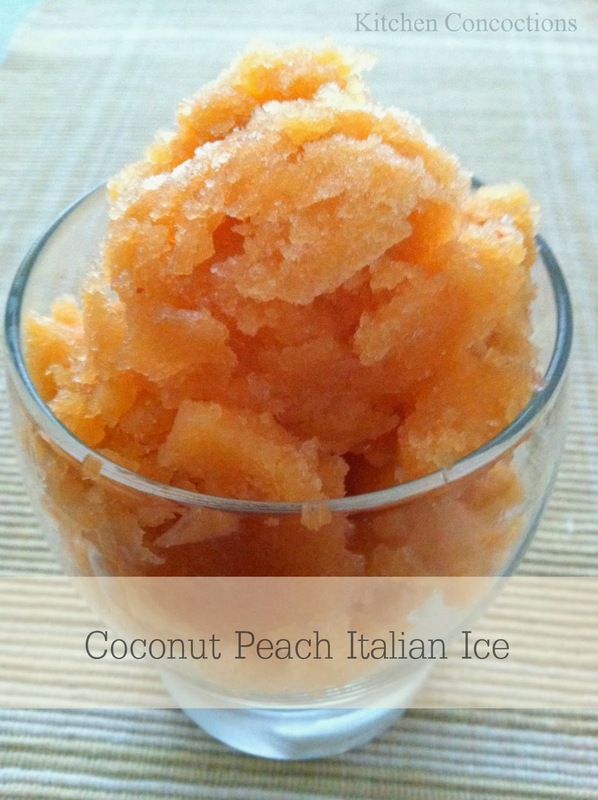 So I decided to make an Italian ice with them, and boy I’m glad I did! This is real yummy! For the peach puree, just pit and peel your peaches and blend them in a blender until smooth. Combine all the ingredients in a bowl (or if using the blender just add all the ingredients to the blender with the peaches) and mix until the sugar has dissolved. Refrigerate for at least 2 hours. Place in an ice cream maker and make according to the manufacturers directions. Allow to churn for about 10-20 minutes, depending on the consistency you want. For a very soft Italian Ice you can serve it right away. Otherwise, freeze it in an airtight container for 1-2 hours before serving.